Boy Raver, Asha, Retrospect and Street Creeps, Tasha, Killa P.
This show was 1st in the global rave chart, 1st in the global old skool chart and 9th in the global house music chart. 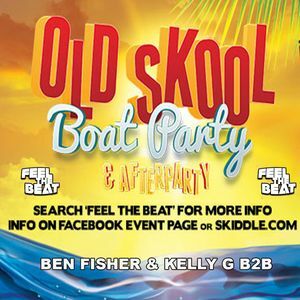 The b2b set from Ben Fisher & Kelly G on the "Feel the beat oldskool boat party" on 30th August bank holiday sunday 2015 ( 1 hour set mixing it up with a lot of "new" oldskool piano tracks/ remixes plus a few classics thrown in for good measure :) ENJOY !! Oi oi Ben love this.